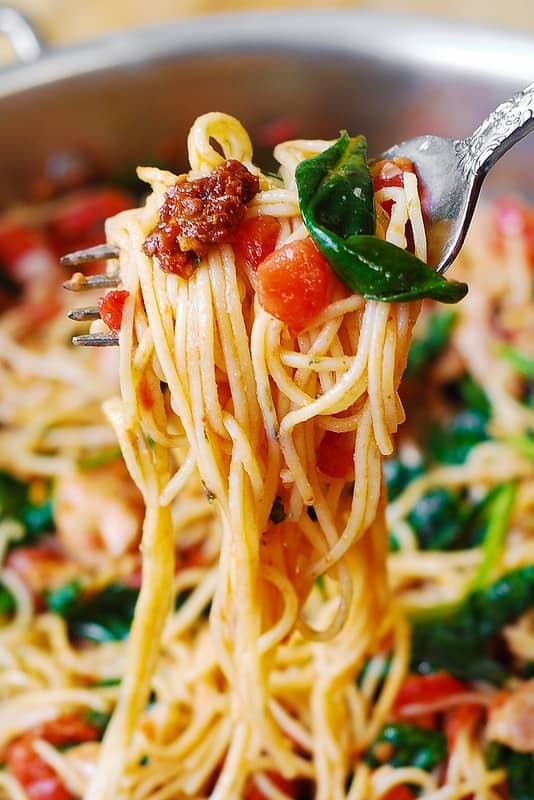 Tomato Spinach Chicken Spaghetti – this recipe features pasta, fresh tomatoes, sun-dried tomatoes, fresh basil, spinach, garlic, and olive oil. It’s a great Summer pasta recipe! Easy and quick! Only 30 minutes to make. A fantastic way to prepare chicken pasta using fresh vegetables! 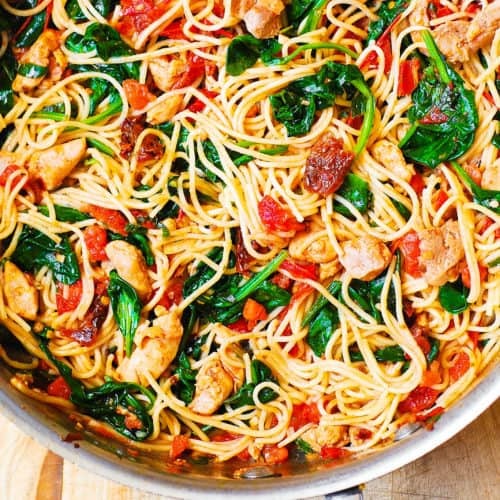 This chicken pasta has a good variety of fresh ingredients: spinach, tomatoes, basil, garlic. Add chicken, sun-dried tomatoes and good quality olive oil to the mix – and you get a healthy and light dinner! So good! This recipe reminds me of tomato spinach shrimp pasta that is also very light and refreshing! This Mediterranean style meal is packed with vegetables, protein and good oils. When we think about chicken pasta, we usually picture a pasta dish with lots of cream sauce and white cheese. Like this chicken and bacon pasta with spinach and tomatoes in garlic cream sauce. This spinach tomato chicken pasta has no cream sauce. It’s a healthy version of chicken pasta. And, it tastes like comfort food. This vibrant chicken spaghetti one of the most popular recipes on my site. It has been pinned 1.6 million times and visited by millions of people. 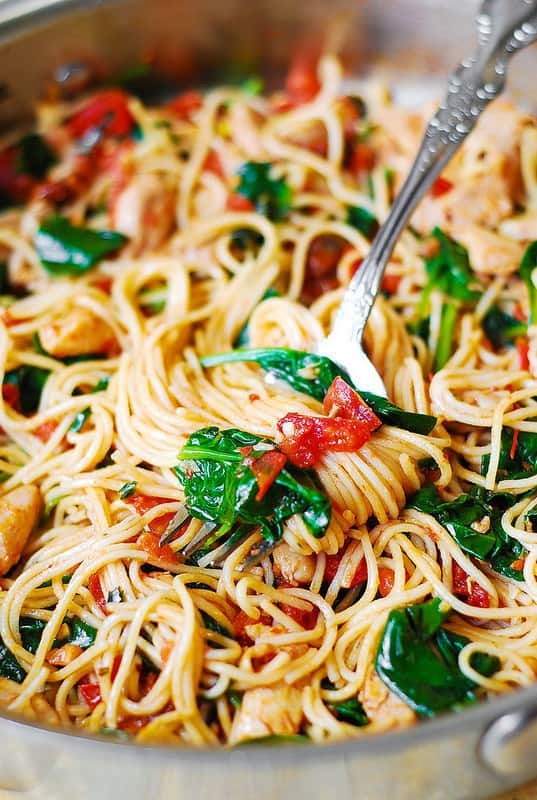 I hope you try this Tomato and Spinach Chicken Spaghetti Pasta. 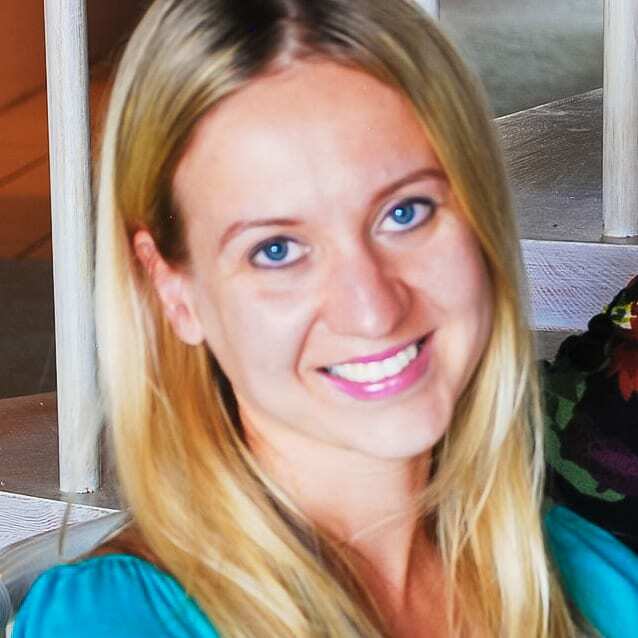 See for yourself why it is so popular! Did I forget to mention that this pasta recipe is easy to make and takes only 30 minutes from start to finish? Not bad for a good-looking dish that tastes like comfort food! And, it looks beautiful, vibrant and colorful! 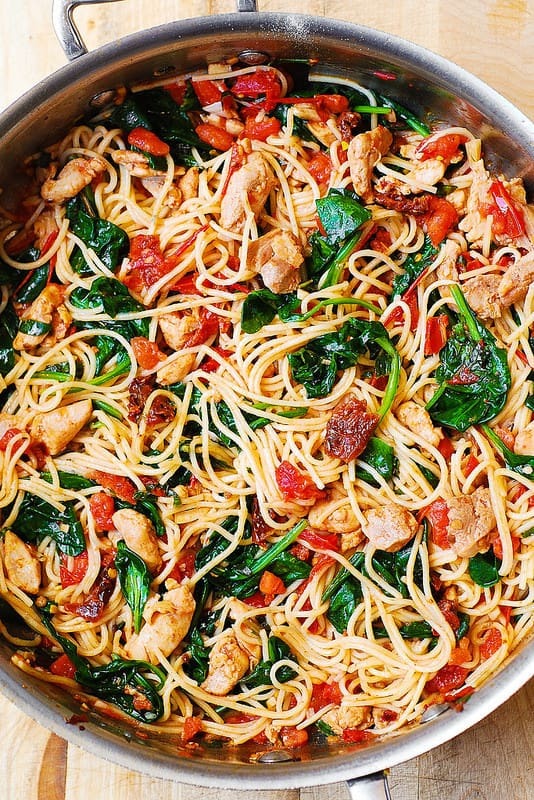 What makes this tomato spinach chicken pasta even more special? This recipe’s main ingredients are fresh tomatoes, basil, garlic, and spinach. To make this pasta even more flavorful, I also used sun-dried tomatoes and red pepper flakes! They added so much flavor! Once the chicken pasta is completely cooked, I highly recommend that you add 3 tablespoons of high-quality olive oil. Stir it into the final pasta dish, off heat. It’s so tasty and so good for you! Use spaghetti, fettuccine, linguine, angel hair pasta, or pappardelle pasta. Use skinless and boneless chicken thighs. Or, use skinless and boneless chicken breasts. Chop chicken meat into smaller pieces. This is the ideal recipe for trying out all sorts of artisanal pasta that we often see in the stores. Make this recipe with green spinach pasta, or orangy-looking sun-dried tomato fettuccine, artichoke pasta, etc. You get the idea! Use all those colorful unusual kinds of pasta we see in the stores in this recipe! Don’t have spinach? Use other greens. Swiss chard or kale will work great in this recipe. 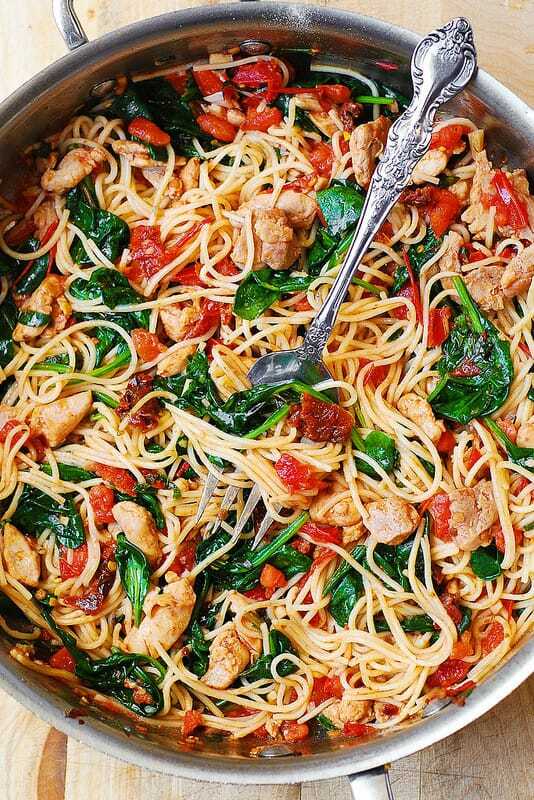 I hope you’ll make this easy tomato spinach chicken spaghetti. It makes a truly Mediterranean dinner! This chicken pasta recipe has lots of fresh ingredients: garlic, tomatoes, and spinach. This easy and quick dinner will become a family favorite! Add chopped sun-dried tomatoes and 2 tablespoons of olive oil, drained from sun-dried tomatoes, to a large skillet, on medium-low heat. Add chopped chicken. I used boneless skinless chicken thighs and prefer to use them, but you can use chopped chicken breast, as well. Add red pepper flakes, and salt over all of the ingredients in the skillet. Cook on medium heat until the chicken is cooked through and no longer pink, about 5 minutes. Add chopped tomatoes, chopped fresh basil leaves, fresh spinach, and chopped garlic to the skillet with chicken. Cook on medium heat for about 3- 5 minutes until spinach wilts just a little, and tomatoes release some of their juices. Remove from heat. Taste, and add more salt to taste, if needed. Cover with lid and keep off heat. Cook pasta according to package instructions, until al dente. Drain. Add cooked and drained pasta to the skillet with the chicken and vegetables. Reheat on low heat, mix everything well, add more seasonings (salt and pepper), if desired. Remove from heat. At this point, when the pasta and vegetables are off heat, you can add more high-quality olive oil. It's optional but really tasty! Or you can add more olive oil from the jar from the sun-dried tomatoes. Made this tonight for the family, with a couple tweaks. No sun-dried tomatoes, dried instead of fresh basil and added 8 asparagus spears (1″). Loved it! Served it with Red Lobster biscuits. Yum! Can this be premade and put into the freezer? Yes, you can freeze this! Delicious! I added more salt and pepper, and sautéed some onion with the chicken. I roasted a spaghetti squash that weighed a little over a pound and substituted that for the pasta. Once plated, I garnished with additional basil cut into a chiffon add and some freshly grated parmegianno reggiano. Serving size was about 1 3/4 cup. I will make this again! Thank you for this recipe! You are very welcome! Your changes sound so good! Love that you used spaghetti squash instead of pasta! I am so glad you enjoyed this recipe! Glad to hear the recipe worked with fire roasted diced tomatoes. I’m a picky eater and i LOVED this!!! Great job !! Thank you! I am very happy to hear that! I would suggest that you make this recipe without the chicken, but following the instructions. And, then just serve this pasta (without chicken) as a side dish to tuna. Cooking for a friend tomorrow night and he likes ‘red sauce’. Can I add a tomato sauce without losing the other flavors? Yes, you can add the red sauce if you like. If you add red sauce, you might have to adjust seasonings, add more salt or more spice, etc. You can also sprinkle the pasta and the sauce with the shredded Parmesan when serving.